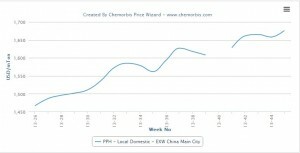 Following four consecutive months of increases, China’s local PP market opened the month of November on a firm note. Sentiment is firm in the country, mostly driven by concerns over supply tightness. Players are divided about the medium term supply outlook as some production units are set to come back on-line soon while international sellers are considering diverting some of their allocations to China to take advantage of stronger netbacks relative to other global markets. However, some fresh plant shutdowns are also scheduled in the region and some sellers believe that this will keep availability limited. 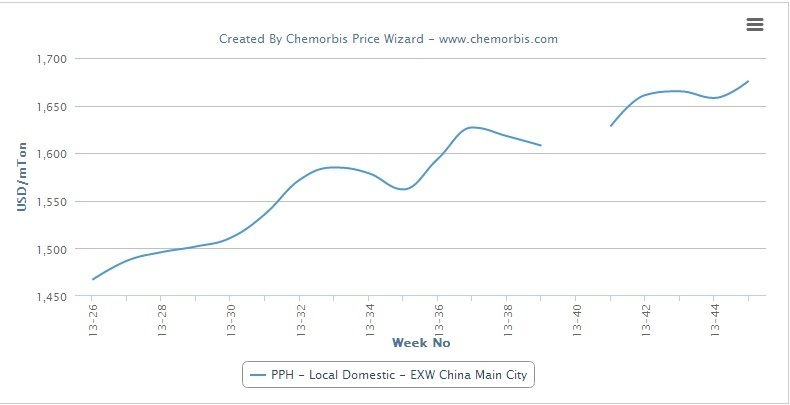 According to data from ChemOrbis Price Index, domestic homo-PP prices in China have been steadily increasing since the last week of June, with the total increase in prices on an ex-warehouse China basis coming to nearly $210/ton over the past four months, pushing prices to their highest levels since August 2011. Local prices continued to firm up at the start of this week as prices for locally-held cargoes rose CNY100-250/ton ($16-41/ton). A converter manufacturing woven sacks stated that lower-priced materials are becoming increasingly scarce in the market as limited availability and price hike announcements from producers are pushing prices higher. “We are purchasing as normal as we do not expect the trend to change over the short term,” the buyer stated. A trader in Vietnam reported that they are able to sell around 700 tons per week to China without conceding to any major discounts. “Several Chinese producers are undergoing maintenance work and this has disrupted supply,” the trader added. In production news, some facilities are set to shut down this month although several plants are set to resume production. Shenhua Ningxia Coal Group plans to restart its 500,000 tons/year PP plant following a 10-day maintenance shutdown. In addition, Sinopec Maoming and Luoyang Petrochemical were reportedly planning to restart their plants in late October. The plants have capacities of 300,000 tons/year and 140,000 tons/year, respectively. According to ChemOrbis, on the other hand, Fujian Refining and Petrochemical shut down its 120,000 tons/year PP plant at the end of October for a two-month maintenance. In addition, Zhejiang Shaoxing Sanyuan is planning to shut two PP plants with a combined capacity of 500,000 tons/year in the second half of the month.